Makers of outdoor gear. Owned by founder Yvon Chouinard, a legendary rock climber and mountaineer. Parent company of Patagonia, plus other clothing and outdoor gear makers. Founded and owned by legendary rock climber and mountaineer Yvon Chouinard. 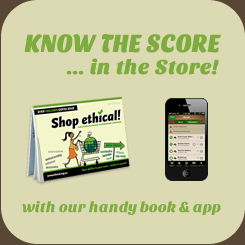 One percent of all sales is given to environmental groups yearly. Responsible Sourcing Network's 2014 report Cotton Sourcing Snapshot: A Survey of Corporate Practices to End Forced Labor includes survey results and ratings of 49 companies reflecting actions they are taking to stop cotton from Uzbekistan picked with forced labor from entering their supply chains. The survey offered a maximum of 100 points across 11 indicators in the categories of Policy, Public Disclosure, Engagement, and Implementation & Auditing. This company was one of only five to score over 50 points. 19 companies scored under 25 points, and two companies scored zero. A grade in the Baptist World Aid Australia's 'Ethical Fashion Report 2019', which grades companies, from A to F, on the strength of their systems to mitigate against the risks of forced labour, child labour and worker exploitation in their supply chains, as well as protect the environment from the harmful impacts of the fashion industry. Assessment criteria fall into five main categories: policies, transparency and traceability, auditing and supplier relationships, worker empowerment and environmental management. This website by German NGO Earth Link rates companies on their corporate policies against child labour, production monitoring and accusations of child labour. This company received at least one green mark, and no red marks, indicating good performance in one or more of these areas. This company has signed the Cotton Pledge with the Responsible Sourcing Network, signifying a public commitment to not knowingly source Uzbek cotton for the manufacturing of any of their products until the Government of Uzbekistan ends the practice of forced labor in its cotton sector. The Uzbek government uses local government officials, hospital directors, and school presidents to mobilize workers; and detains and tortures human rights defenders seeking to monitor the harvests. Rank a Brand searches the websites of brands for the answers to carefully targeted questions. From this they calculate sustainability scores based on the themes of environment, climate, labor issues, and transparency. Brands owned by this company received a 'B'. The Apparel and Footwear Supply Chain Transparency Pledge (Transparency Pledge) helps demonstrate apparel and footwear companies' commitment towards greater transparency in their manufacturing supply chain. Transparency of a company's manufacturing supply chain better enables a company to collaborate with civil society in identifying, assessing, and avoiding actual or potential adverse human rights impacts. This is a critical step that strengthens a company's human rights due diligence. This company is fully aligned with the Transparency Pledge, thereby committing to regularly publish on its website a list naming all sites that manufacture its products. The bluesign® Standard sets "best practices" for the use of chemicals and resources  including water and energy  in the textile industry. Textile manufacturers who are bluesign system partners agree to establish management systems to improve environmental performance in five key areas of the production process: resource productivity, consumer safety, water emissions, air emissions, and occupational health and safety. They regularly report their progress, are subject to on-site audits, and must meet improvement goals to maintain their status. This company is a member of the CanopyStyle initiative, which came about when research found that millions of trees are used every year to produce dissolving pulp, a key ingredient for fabrics such as rayon/viscose. The campaign seeks to phase out the use of endangered forest fibre in fabric. Starting in late 2013, every single merino baselayer style by Patagonia Inc., including all merino socks, will be made with wool sustainably sourced from the grasslands of Patagonia in Argentina. The scheme will contribute to the regeneration of the Patagonian grasslands, reversing the current trend toward desertification. This company is a member of the European Outdoor Conservation Association, a non-profit charitable organisation which supports conservation work by raising funds from within the European Outdoor sector and promoting care and respect for wild places. Some companies intentionally make their repair manuals unavailable, sabotaging local repair shops and forcing consumers to buy new products. This company makes its repair manuals available online. When joining the Fair Labor Association (FLA) this company committed to promoting and complying with international labor standards throughout their supply chain. The FLA does not accredit the company itself; rather, they accredit the company's labor compliance program. Being granted accreditation implies that their workplace standards program is substantially in compliance with the FLA Code. Patagonia are working with Fair Trade USA to offer Fair Trade Certified apparel in 2014. This company has committed to stop using down from geese and ducks who have been subjected to force feeding and live plucking. The outdoor industry uses hundreds of tons of down that come from millions of geese and ducks. Much of this comes from Hungary and China, where force feeding and live plucking of geese and ducks is permitted. This company has announced that they don't sell animal fur or are phasing in a fur-free policy. This company is a founding member of the Sustainable Apparel Coalition, a multi-stakeholder initiative launched in March 2011 by a group of global apparel and footwear companies and non-profit organizations (representing nearly one third of the global market share for apparel and footwear). The Coalition's goals are to reduce the apparel industry's environmental and social impact, and to develop a universal index to measure environmental and social performance of apparel products. This company is a partner of Better Work, an initiative of the UN's International Labour Organization and the International Finance Corporation which brings diverse groups together - governments, global brands, factory owners, and unions and workers - to improve working conditions in the garment industry and make the sector more competitive. This company is a member of the Textile Exchange, a global non-profit that works closely with its members to drive textile industry transformation in preferred fibres, integrity and standards and responsible supply networks. They identify and share best practices regarding farming, materials, processing, traceability and product end-of-life in order to reduce the textile industry's impact on the world's water, soil and air, and the human population. The Footprint Chronicles application on their website allows consumers to track the impact of specific Patagonia products from design to delivery. This company is a member of the Green Chemistry and Commerce Council (GC3), a business-to-business forum that advances the application of green chemistry and design for environment across supply chains. It provides an open forum for cross-sectoral collaboration to share information and experiences about the challenges to and opportunities for safer chemicals and products. The California Transparency in Supply Chains Act of 2010 (SB 657) requires companies operating in California to disclose their efforts to eradicate slavery and human trafficking from their direct supply chains. KnowTheChain.org has examined this company's disclosure statement and concluded that it addresses the majority of SB 657 requirements. Follow the link to see this company's disclosure statement. Cam Walker from Friends of the Earth Melbourne has created a website which profiles outdoor gear companies and rates them according to a range of sustainability criteria. Follow the link to see this company's profile. 1% for the Planet is a global movement of 1300+ companies that donate 1% of their sales to a network of 2300+ environmental organisations worldwide. This company is the founding member.